Verizon quietly introduced a new $75 single line plan today that gives customers 2GB of monthly data, along with unlimited talk and text. According to sources of ours, this new plan is a “limited time promotion,” though we have no word on when it will end. If that plan doesn’t sound like the deal for you, know that Verizon also has a semi-secret option called the “SAVE” plan that is $60 for 2GB of data, plus unlimited talk and text. You need to qualify for it, but it’s worth knowing about should you be in the market for discounted service and a new phone. The $75 plan works like this – sign-up for service (appears to be no-contract) and receive 2GB of data with unlimited talk and text for $75. If you want to lower the monthly price by $10, you can also sign-up for Verizon EDGE, which is Big Red’s device payment plan that spreads the cost of a full retail phone out over 24 months. The “SAVE” plan – should you qualify – is probably your best value. From our understanding, this is a plan you’ll have to specifically ask about, as Verizon may not offer it up front. 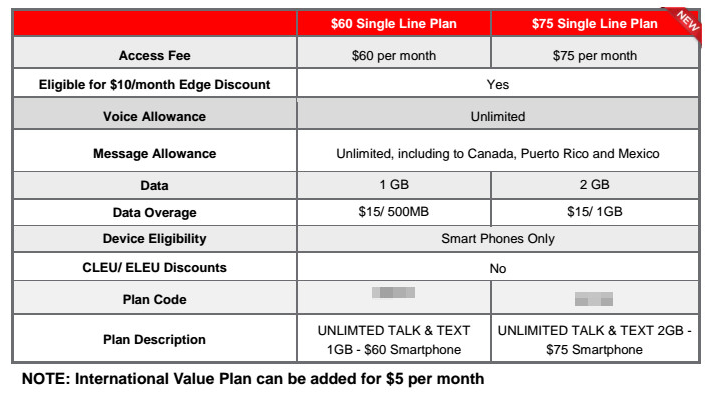 The plan looks like this – for $60, you get 2GB of data and unlimited talk and text. You do have to sign a 1-year contract, so this is not a month-to-month plan. In order to qualify, you have to be within 12 months of a contract end date or already out of contract. We should point out that with the “SAVE” plan you cannot share data, use mobile hotspot (unless you pay extra for it), or receive the $10 EDGE discount. If you are within a contract end date and don’t mind signing a 1-year contract, think about asking for the “SAVE” plan.